How to check when your Windows 7 was installed? The Customize Windows > Windows 7 tutorials > How to check when your Windows 7 was installed? systeminfo | find "Install Date"
This Article Has Been Shared 7864 Times! Articles Related to How to check when your Windows 7 was installed? Title: How to check when your Windows 7 was installed? 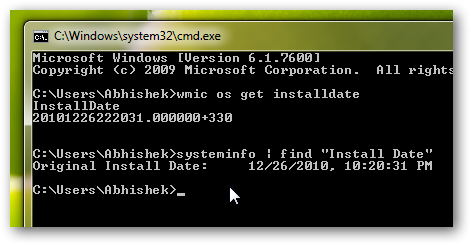 Cite this article as: Abhishek Ghosh, "How to check when your Windows 7 was installed?," in The Customize Windows, February 4, 2011, April 25, 2019, https://thecustomizewindows.com/2011/02/how-to-check-when-your-windows-7-was-installed/.